World Card Making Day is a day dedicated to making handmade cards! This year the world celebrates the day on October 7, but one day wasn’t enough for Stampin' Up!, so for ten days (October 1–10), you can get 15% off Notecards & Envelopes and select stamp sets. Also, when you buy Fast Fuse Adhesive, you’ll get two refills for FREE! 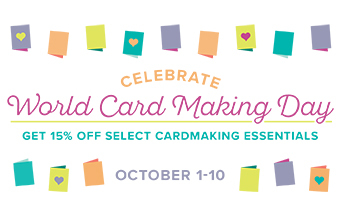 These items will help you celebrate the best hobby of all—card making! Stampin' Up! also provided a list of coordinating Designer Series Paper—take advantage of the separate sale happening now! Note - info on the Designer Series buy 3 get 1 Free paper sale will be posted tomorrow but if you wanted to order any of these items today you can see the paper at my Online Store. Coordinating Designer Series Paper (Not part of the World Card Making Day sale.